Have you ever wondered how fabric companies get your favorite quilt shop to carry their quilt fabric? Today, we are going to learn just that. I got the chance to chat with Tiffany Jawor-Smith from QT fabrics to see how they let not only quilt shops but us as well what they have available. Tiffany is my contact at QT and how I talked them into doing these interviews. 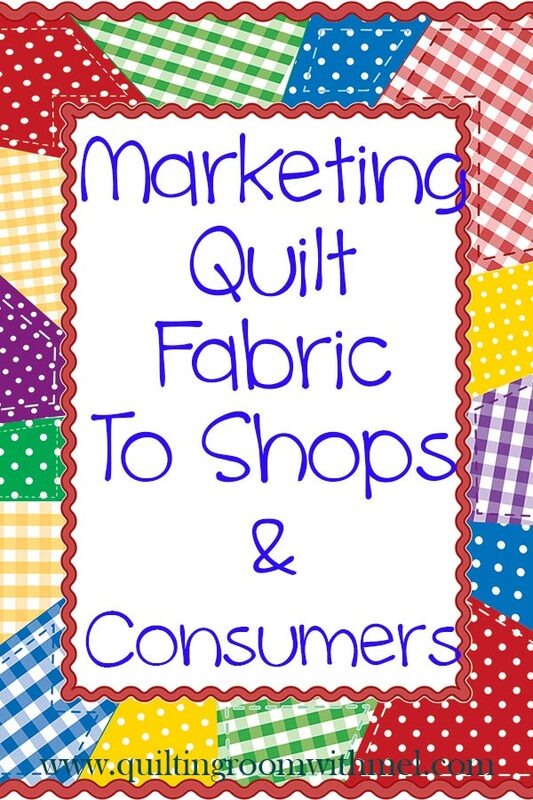 I knew snippets of the information below but didn't realize just how in-depth marketing of quilt fabric gets. If you missed it we have already covered how quilt fabric designs are chosen. We will also be covering how the fabric is shipped from the manufacturer to our favorite shops in the near feature. Will start by learning more about Tiffany as a person. I got to chat with her on the phone this summer and really enjoyed our talk. She's a really fun person so let's see what she says about herself. "I have been with QT Fabrics since 2001 with a brief time away to teach. I was an intern here during college while studying textile design. Our rich history in textiles and the industrial revolution (dating back to 1807) is something that caught my attention. I’ve worked as a designer, stylist, product manager, marketing brand manager and now creative manager for QT. With every opportunity and job title, I’ve learned so much! My entire childhood was spent sewing and crafting. To be able to come to work every day and help inspire people to follow their creativity (not to mention, work with pretty fabrics and fun people) is awesome!" This past year the quilting bug got Tiffany. She made her first quilt for her kitty using one of QT's new lines. It even had catnip! It was just a small quilt but she had three layers sewn together so it is a quilt. She's even planning on taking some classes at her local quilt shop to learn some more techniques. Welcome, to the quilt family Tiffany! 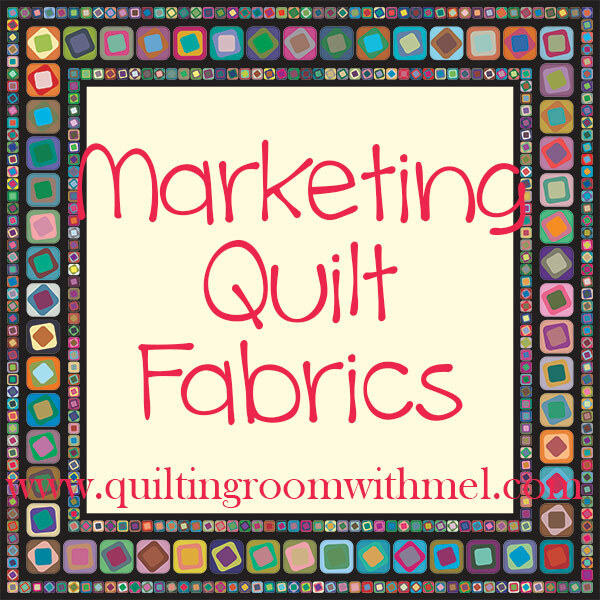 QT Fabrics marketing strategy has changed over the years. That's really not shocking, I think most companies, regardless of their niche would say the same thing. Social Media is where most people are at these days so they do focus on their Facebook page, new Facebook group, Instagram, and blog. I use a similar format to market my own work and I'm sure most of you reading this found me from Facebook, Instagram, or Twitter. They also work with bloggers and designers to inspire consumers to use their fabrics. I have worked on two projects so far with QT Fabrics. They sponsored the Driver's Footsteps Quilt and the No Y-Seam Eight Point Star. This a win-win for all of us. A fabric company's support can really help a blogger like me out. They let me play with new and existing lines of fabric and they share my projects on their social media. The excitement of my projects or other bloggers and designers help to get local quilt shops to carry that fabric. I know my local shop has started carrying different fabrics because people asked about it so they could make a project they saw somewhere. One thing I've always wondered is why don't we see commercial for quilting on TV. I have seen other crafting items advertised on TV but I have never seen any of my favorite quilt supplies. I asked Tiffany why QT doesn't and I would assume most companies would have a similar answer. "Interesting question! We sell to independent shops here in the U.S. and to distributors around the world. Our campaign would need to be National, if not Global. That, coupled with our ever-changing collections, variety, and how each region varies in the fabric selection, it would be extremely expensive and tricky to target the right audience. Beyond the budget, focused campaigns that make sense for each region of the world is a big factor prohibiting us from advertising on TV. We are a proud sponsor of Love of Quilting TV and It’s Sew Easy TV (both on PBS) which is great exposure to the quilting/sewing enthusiast target audience." QT only sells to independent shops, you won't find them in big box stores. The fabrics you find in chain stores are not the same as their fabrics. "QT Fabrics are created with the dedicated quilter/sewer in mind. We are proud of the hand of our fabric, colorfastness, thread-count and overall quality. The difference in quality is an important distinction to consider when shopping at your independent quilt or fabric shop." Like was mentioned above, we the consumer, are the gateway to the shops. Once the consumers are excited it's on to support for the shops. QT is an employee-owned company so they understand the needs of small business owners. They provide the shop owners social media graphics, projects to inspire the consumer, and customer support. They don't just want to sell the shop fabric they want to make sure the shop is able to sell it to the consumer. I thought their approach to making repeat sells was interesting. Just like I want you to come back to read more than just one post here at The Quilting Room all fabric companies want shops to keep buying their fabrics. "We do our best to not only provide them with the fabric collections, but with tools to inspire their consumers. Through project sheets, graphics for social media and stellar customer service, we make sure that we are partners with our shop customers. Shop feedback and satisfaction are very important to us., every step of the way. Also, we have employee salespeople. This way, their focus is to go to as many shops as possible and show them the latest collections. That sets us apart from our competition. Having a sales team that are employees of the company (and not representing multiple companies) keeps the line of communication open between the shops and our main office." I hope you are enjoying this series and learning more about the processes our favorite fabrics go through before they get into our stash. If you want to keep up with us here in The Quilting Room be sure to sign up for our newsletter.